Will Redmond dominate thanks to clever Cortana? It isn't often that Microsoft is the company that beats Apple and Google to the punch, especially when it comes to something as cool and sophisticated as virtual assistants but, with Cortana, Redmond has done just that. The presentation that Microsoft gave at Build 2016, the company's annual conference in which it explains where it's at and what it's doing, focused on 'bots', artificial intelligence, and improving services like Cortana. Siri, the virtual assistant that Apple launched alongside the iPhone 4S, and Google Now, the assistant embedded in most new Android phones, are rapidly being outpaced by Microsoft's assistant, which is available on smartphones, tablets, and PCs. This may not seem like a radical difference, but it does mean that Cortana is well-placed to dominate in an area that Microsoft thrives in – the enterprise. Embedding Cortana into the mindset of businesses is important and, thanks to the rapid uptake of Windows 10, possible. Every Windows 10 PC has the little box in the bottom left that, when pressed, brings up Cortana, ready to answer any queries, help with any tasks, or respond to inane prodding. Apple and Google do not have this advantage as the assistants are not available on OS X or Chrome OS, the company's respective PC operating systems. This isn't the first time in recent memory that Microsoft has outmanoeuvred its competitors. Windows 10, the newest version of the operating system that went on sale last summer, runs across smartphones, tablets, PCs, Xbox, and Internet of Things devices seamlessly, ushering in a new era of universal apps and the Universal Windows Platform. This platform is what enables Cortana and will, in the future, allow Microsoft to make sweeping advances with its software that can then be rolled out across any number of devices across all hardware ranges. 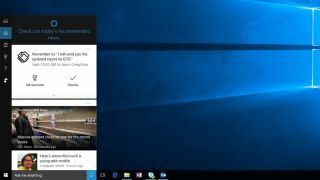 Cortana is simultaneously available on a Microsoft smartphone, a Lenovo tablet, and a Dell PC, and, thanks to Windows 10, she works just the same on all of them. Build also saw Microsoft adopting a different kind of technology: bots. Essentially, bots are little pieces of software that 'attach' onto other software and offer services automatically. For example, a bot enabled in Skype can translate a chat in real-time while a bot in Edge, the browser in Windows 10, can automatically order a pizza from Domino's. Microsoft is describing this as 'Conversation as a Platform' and spent a lot of time on stage explaining why it is so important for the future of the company, especially since it failed to get in on mobile quick enough to have a meaningful market share now.